Amber Fort is situated on a hill in Amer, Rajasthan. It stands on top of a scalable mountain, next the beautiful Maota Lake. 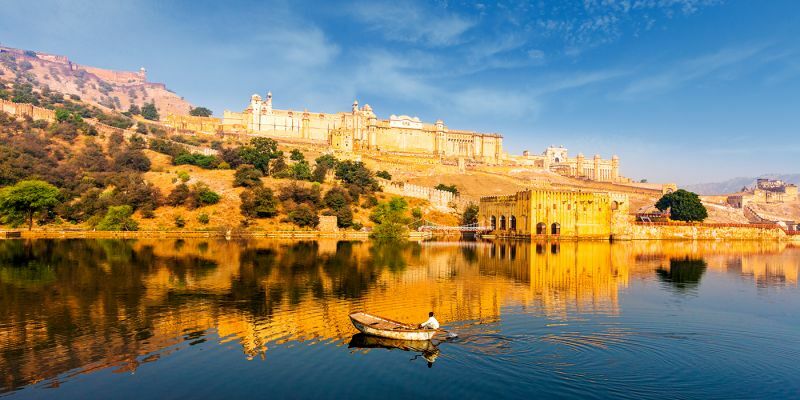 The fort, also referred to as the Amber Palace, is a major tourist attraction in Jaipur due to its sublime appearance and geographical advantages. What adds to the fort’s value is that it is related to rich treachery and bloodshed history. The picturesque fort was built by Raja Man Singh, using red sandstone and white marble. The construction of the fort began in 1592, and was modified regularly by several rulers until 1600. The fort reflects a combination of Hindu and Muslim architecture. As the palace has very attractive apartments, it served as the residence of the Rajput Maharajas for a long time, besides being a fort. Additionally, there is a palace that was built before the Amber Fort. It rests on a valley behind the fort, and is one of the oldest palaces in India. The fort consists of four different sections. Each of the sections has its own gate and courtyard. The first gate is named Suraj Pol, which means Sun Gate. It is named like that because the gate faces the sun and witness the sunrise every morning. This gate is an entrance to the first courtyard called Jalebi Chowk. 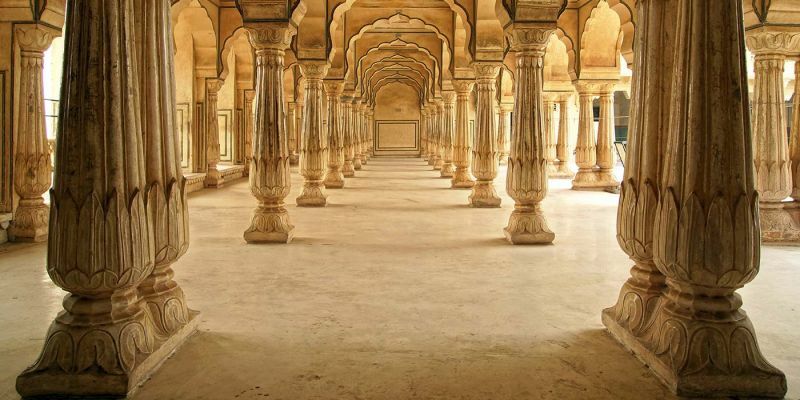 The soldiers gathered and celebrated their victory in this courtyard, during the time the palace was ruled by Rajputs. The second courtyard is featured by the Diwan-i-Am hall, which has latticed galleries, and the painted gate-away Ganesh Pol. The hall is led to by a set of stairs. The Amber Fort’s enterance is through the Dil-e-Aaram Garden, which represents the traditional Mughal style. There is a small temple of Goddess Sila Devi. The temple is characterized by massive silver doors. As for the third courtyard, there are two impressive buildings, situated opposite to each other. The first building, Jai Mandir or Sheesh Mahal (palace of mirrors), is situated on the left. They celebrated victories and other occasions in this building. The other building opposite to Jai Mandir is called Sukh Mahal (Hall of Pleasure). This building was used by the royal family to spend some leisure time alone. 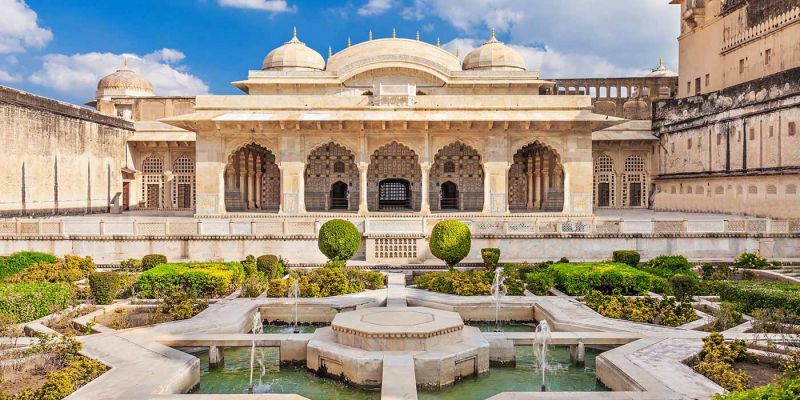 The palace built by Raja Man Singh I, is located toward the southern region of the courtyard. The exit of this palace directs to the town of Amer. At last, the fourth courtyard is an interesting one. This courtyard was used as the residence of the royal women, including the queens, queen mother, and mistresses. This part was sheltered, as the kings visited the queens or mistresses without being seen by anyone. Thus, the Amber Fort is considered one of the most famous forts and one of the main attractions in India for its great value and rich history.